Over the years, Halloween has become one of the most celebrated holidays of the year, and this is important as the Halloween season lasts for the whole month of October. With the advent of high-tech horror movies and shows coupled with their amazing special effects, haunted attractions strive to create an atmosphere of realism that rival these Hollywood films and television. Now more than ever, people are going to haunted attractions, hayrides, corn mazes, and pumpkin patches. Haunted Houses in the Philadelphia, Pennsylvania area are some of the scariest haunted houses in America. And, Randy Bates, better known as the mayhem-keeper, operates two major haunted attractions in the Philadelphia, Pennsylvania area. In 1991, he opened The Bates Motel and Haunted Hayride, located on Arasapha Farm in Glen Mills, PA, and then in 2009 he became the managing partner of the Pennhurst Haunted Asylum, located in Spring City, PA. Both are highly detailed and themed, and have a combination of high-tech animatronics, digital sound and light systems, and professional actors. The Bates Motel and Haunted Hayride is a member of America Haunts, the national coalition of America’s best haunted attractions. With its trilogy of terror that includes The Bates Motel, Haunted Hayride, and The Haunted Corn Maze, Arasapha has been terrifying visitors with some of the most amazing heart-pounding theatrics, Hollywood-style special effects, costumes, props, and trained actors for years. The attraction has garnered national attention and even been named one of the best 13 haunted attractions in America year after frightening year. Additionally, the Bates attractions have been featured in various publications including Haunted Attractions Magazine and Hauntworld Magazine as well as on the Travel Channel. The Pennhurst Haunted Asylum consists of 4 main attractions. The Asylum is a hospital themed walk-through of the first and second floors of the old administration building. The Dungeon of Lost Souls is a medical experiment laboratory gone horribly wrong. Using items found on the abandoned Pennhurst property, this attraction is dark and intense. The Tunnel Terror haunt is located in the subterranean tunnels of the Pennhurst complex: a 900-foot walk-through of the darkest history at Pennhurst. The Ghost Hunt attraction is a self-guided tour of the Mayflower dormitory, reportedly the most haunted building on the premises, and featured on Ghost Hunters and Ghost Adventures. In this edition of The Creative Spotlight, I had the pleasure of interviewing Randy Bates and asking him a few questions about his farm, his career in the haunt industry, his attractions, his influences, his success and struggles, and the future of the fright business. TCS: How and when did you decide to delve into a career in the haunt industry and whom or what would you say inspired you? Randy Bates: In the late 80’s there was a haunted trail nearby that was a fundraiser for a local historical society. In 1990, they shut down due to damage to their property. In 1991, we decided to run a similar operation, but do it from our hay wagons. For 15 years, we had been doing hayrides and bonfires for church groups, scouts, fraternities, and so on. So, we had the infrastructure in place to start the haunted hayride. I really had no one that inspired me; in fact, I had never heard of haunted hayrides and never went to a haunted house. I always loved scaring people and tormented my sisters and their friends. This is our 26th season and the business has saved our family farm and provides income to over 300 people. TCS: For the benefit of those who are not familiar with Arasapha Farm located in Glen Mills, Pennsylvania, can you describe for us the three main haunted attractions and how they have evolved over the years? RB: The Haunted Hayride began in 1991, Bates Motel opened in 1996, and the Revenge of the Scarecrows Haunted Trail opened in 2000. Each event gets additional props, sets, and scenes each year as we always strive to be the best. For over 25 years, the Haunted Hayride at Arasapha Farm has been scaring its visitors with amazing props, digital FX, great actors and extraordinary professional makeup. The Hayride has been featured several times on the Travel Channel and has been rated as the Number 1 Haunted Attraction in America by Hauntworld Magazine, USA Today, and many other national publications. The Haunted Hayride is a 25-minute, action packed, heart pounding ride through the dark forest of Arasapha Farm, located just outside of Philadelphia Pennsylvania, and is filled with huge, detailed sets, giant monsters and more pyrotechnics than a Kiss concert. With scenes like a 100’ foot long, 40-foot-tall drive thru insane asylum, a full-scale mockup of a New England church and a 200-foot-long cave, the Haunted Hayride is an amazing example of Hollywood style sets and props. And then there is the scares. With over 75 actors and 25 scenes, it is no wonder why this event is always on the “Top 13” national lists of the best haunted attractions. To celebrate our 25th Anniversary, we have added a new, giant set that will put this year’s hayride over the top. This jaw dropping scene is guaranteed to strike fear in the bravest of souls! And, this year we present the return of the Headless Horseman, one of our customer’s all-time favorites. Don’t forget to check into the Bates Motel, for the most incredible display of terror and mayhem this side of Hollywood. Filled with high tech special effects, digital soundtrack and lighting, the Bates Motel takes Halloween to a new level of horror…up close and personal! With incredible detail and stellar acting, it is no wonder why the Bates Motel is considered one of the best Haunted Houses in America. The realism in this attraction is astonishing and is guaranteed to wow the experienced haunted house enthusiast. As you creep through this show, you see levitating spirits, floor boards that come alive, pictures that follow you, and incredible, custom animatronic props that you will not see anywhere else. The actors interact with you on a personal level and the screams echo throughout the building! What’s new for this year? You will have to come out and see for yourself! The Bates Motel is a high startle; high action haunted attraction and not recommended for children under 8 or people with heart conditions. The third show in this Trilogy of Terror at Arasapha Farm is the Revenge of the Scarecrows Haunted Trail. It is a terrifying walk through a tall corn field filled with buildings and sets, tons of animatronic monsters and over 30 actors in full makeup and custom costumes. This event is like no other corn maze in the country and has fast become a favorite at the Bates Farm. TCS: When do you start preparing for the Bates Motel haunted hayride and the haunted corn maze and tell us what exactly goes into the overall preparation? RB: Preparation begins in January. We start with a brainstorming session with our managers and creative staff. Ideas are thrown around and detailed plans are drawn up. Build crew lists materials needed, electronics, lighting, and what props we will need. Over the winter months, our art staff refurbishes older props and creates new ones in our mold and sculpts facility. The construction crew repairs animatronics, adds new features to the and manufactures new ones in our metal fabrication shop. In March, our staff attends the Transworld Halloween trade show in St. Louis, Missouri. There, we attend seminars, network with other haunt owners, and search the show for new props, makeup, and ideas. Some of our staff, including myself, hosts seminars for the show. These include safety and awareness, show control operations, makeup, and custom mold making. Once we return from St. Louis, construction begins on the Bates Motel. Rooms are torn out and replaced with new ones. By April construction begins on the hayride, usually with additional trails, sets and props. We have our own sawmill on the farm and produce lumber for many of these sets. By July, we are in full blown construction with as many as 15 employees working full-time. When we come up with a new idea, the build crew draws up the construction design and a list of materials, the electronics crew determines how the scene will be triggered, lighting, sound effects, foggers, and most importantly, where the scare is. The art crew then decide how the scene will be detailed, paints needed, additional scene decoration and what the characters will be wearing and type of mask or makeup. All of this is what sets us apart from other attractions is our uniqueness. TCS: Can you talk about how your key staff members utilize your complete workshop on the premises to create some of the details of each of attraction? RB: Our facility has a complete metal fabrication section, wood shop, and creative art department. We make our own makeup appliances, masks, and monsters. TCS: Can you describe the talent search process in becoming an actor for your haunted attractions? RB: First we ask current employees if they have family or friends that would be interested in working for the attractions. We have a link on our website where potential staff can complete an employment form. We also advertise on Craig’s list. Once we have a sufficient number of potential employees, we hold auditions at the farm. We usually hold these in July and August. My Daughter, Angela handles all hiring and staff placement; an enormous job considering we have over 300 employees. At the auditions, our actor managers put these people thru an intensive workshop to determine if they will be suitable for the long hours and physical stress. TCS: Which one of your three attractions is the most popular and why? RB: Our most popular attraction is The Haunted Hayride. This is most likely due to the fact that it’s suitable for all ages. One of my favorite scenes is our collapsing mine shaft. It is something we drew up years ago and still gets great screams. The Bates Motel and Haunted Trail are more intense as the actors and props are much closer to the customers. TCS: Can you tell us about how your attendance at the Halloween Trade Show in Chicago, Illinois, in 1996 truly impacted your decision to open The Bates Motel attraction? RB: In 1996, my staff and I attended the Halloween Trade Show in Chicago, IL. Until that point, we had pretty much developed in a vacuum with little or no outside influence. When we saw the amazing props, masks, and costumes that were available, it totally blew us away. I attended a seminar given by Leonard Pickel, an authority on haunted houses since the early 1980s. We learned how to design and build a haunt from the ground up. I also attended a seminar on haunted hayrides, eager for great information. It was the most disappointing seminar as the presenter was operating his hayride with customers sitting in the back of a pickup truck! This is when we realized that we were at the cutting edge of hayrides, and even had other haunt owners pumping us for info. During this time, haunters would not exchange info with anyone who had an attraction in the same state. I never had that problem and now attraction owners discuss their operations freely. TCS: How long have you and your family owned Arasapha Farm? And, can you describe for us some of the other attractions that you’ve implemented over the years to keep the farm running on a yearly basis? RB: Arasapha farm was purchased in 1952 by my parents Bill and Anne Bates. They raised sheep, chickens and then game birds such as pheasants, quail and fancy birds. They also grew crops. In 1970, my dad and I planted 2000 Christmas trees that we eventually harvested and sold. After my father died in 1982, my wife, two kids and I moved back to the farm to help my mother. Over the years we have developed the farm into an Agritainment venue, with the Halloween events, Daytime children’s events, including bounce houses, farm animal petting zoo, hayrides, corn mazes and other fun games. In 2006, we planted 5,000 trees, and began our Holiday Hayride. This is a ride thru the rolling hills of the farm with huge light displays, festive music, snow machines and live reindeer. We also added a Santa’s workshop, photos with Santa and a gift shop. At all our attractions we offer food and drinks. TCS: Can you give us at least three “Good to Know” facts about The Bates Motel, Haunted Hayride, and The Haunted Corn Maze? If you plan to come out on a Saturday night in October, be prepared to wait in long lines. Our attractions have become very popular over the years and the majority of our customers come on Saturday nights. Always wear comfortable shoes as you will be on a working farm. The Haunted Hayride is always the first attraction to close, so make sure you do that event first. TCS: In your opinion, what do you feel are the key factors in operating a successful haunted attraction? RB: Early to bed, early to rise, work like hell and advertise! To have a successful event, you need a great team. From management staff to artists and IT guys, you must have a complete staff. Marketing is the next most important key to success. A complete marketing plan that includes media ads, print articles, coupons and flyers, and digital marketing is necessary. You also need to have a quality show which will bring in repeat business. Changes to your show are also necessary for the repeaters. TCS: Within Pennsylvania, there are many well-known haunted attractions so what do you feel makes your attraction stand out from all the other scary destinations? RB: There are lots of quality attractions in the area. One thing this has done is raise the awareness of Haunted Attractions in the tristate area. PA has become a mecca for travelers looking for the best haunted attractions, and people come from all over the US and Canada. Our attractions stand out because of our uniqueness. I don’t attend other shows, so all our ideas are our own. Usually by the end of the season, I’m pretty burnt out, but now that my family is running many aspects for the business, it has taken a lot of stress off my shoulders. I still get excited when we design and build new things, and love watching the customers high five each other after attending. TCS: Congratulations on running such a fun and successful attraction for the past 26 years. In that timeframe, what would you say has been the most rewarding and the most challenging aspects of running your haunted attractions? RB: The most rewarding part is watching my children grow up and become major parts of my business. Also, the thank you’s we get from our customers. For over 12 years, we have made all the top 13 lists, including number one attraction in the country 2011, 2012, 2013, and 2014. Being featured in major publications and on network television, including twice on the Travel Channel has also been rewarding. The most challenging aspects of the business is handling over 300 employees. The hiring, paperwork and actor placement takes a lot of time and effort. We have a backup team ready to fill in when staff call out and that makes for a lot of juggling. TCS: Describe your role as Managing Partner with the Pennhurst Haunted Asylum? RB: In 2009, I was approached by the owner of Pennhurst to produce a haunted attraction there. I wrote the business plan and told him that if I was to be involved, that it had to be world class right from the start. The Bates Motel build crew spent most of the spring and all summer in 2010 and opened with two attractions that October. There was a lot of negative publicity surrounding the use of the property, and all my friends said don’t worry, publicity is good. They were right. Opening night was amazing, with all three major networks and Fox News covering us with live feeds. The first year we built the Asylum haunt and the tunnel of terror. We worked right up until opening day. In 2011, we designed the Dungeon of Lost Souls, a more mainstream themed attraction. My daughter, who handled all the social media marketing, mentioned that many people wanted to see some of the buildings as they were 30 years ago. So, we opened the ghost hunt attraction. It became an instant success. Dealing with partners can be difficult at times but we made the best of it. 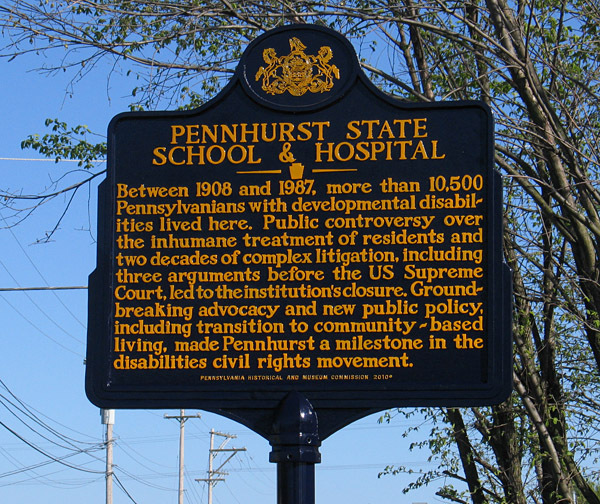 In early 2016 the property owner fell into bankruptcy and was threatened with foreclosure on many of his properties, including the Pennhurst property. A new owner is in the process of purchasing it and will open the attractions this year. I decided to sell my shares in the business, partly to take off some of the stress, and also remove myself from liability issues due to the deterioration of the buildings. The previous owner refused to perform maintenance on the buildings and I feel that they are becoming a serious liability. I wish the new staff well. TCS: What do you think is the fascination behind people wanting to be scared or frightened? And, do you believe in the Paranormal? RB: Getting scared is an adrenaline rush for most people. There is the physical as well as the mental reaction that people crave and hate at the same time. We designed our attractions to be like a roller coaster ride. Suspenseful beginning, music to get them on edge, then hit them with the scares. Our ultimate job is to mess with people’s heads, and we have gotten very good at it. As for Paranormal, I feel that some people are tuned into it and others are not. I have worked, alone, in the pitch-black darkness in the basement at Pennhurst, and never saw anything. My daughter, who is also a professional photographer is tuned in and has had many experiences both at home and at Pennhurst. TCS: Yes, I know we should have ended the interview with 13 questions to keep with the freight theme, but our audience needs to know where do you see the haunted attraction industry headed within the next five years? RB: Every year, I attend the Transworld Haunted Attraction Show, now located in St. Louis. Every other year we attend the IAAPA show in Orlando, Florida. We also periodically attend the Mid-west haunter’s convention in Columbus, Ohio. It’s always great to see old friends and make new ones. In 1997, I helped found the International Association of Haunted Attractions, and was a past board member. In 2003, we founded the association called America Haunts, a group of the largest haunted attractions around the country. There were 5 original members and have now grown to 28. This is an invitation only, market exclusive association that works together to promote haunted attractions around the country. We gather at the trade shows and have an annual meeting each year at one of the member’s attraction. The group trades ideas, develops unique marketing strategies and promote our attractions. In 2005, we hired a film crew and produced a one-hour TV show called America Haunts. It was sold to the Travel Channel, who liked to format so much they shot 4 more shows the nest year, filming our new members. In 2010 I helped found the Haunted House Association, with the idea that any trade association should be run by qualified attraction owners. I am a past board member and past president of this group. In 2007, the Commonwealth of Pennsylvania began requiring Haunted House owners to take a safety course, pass an inspector’s test and file required paperwork with them. I was asked to help write the test and put together seminars specific to haunted attractions. Since then, I teach Code Compliance in Haunted Houses, Hayride Safety, and Outdoor Attraction Safety to new inspectors. Along with these organizations, I am also a member of our local volunteer fire company, sit on the Delaware County Conservation District board, and am the Vice Chairman of the Edgmont Township Supervisors. I see the Haunted Attraction industry going the way of Hollywood and video games. Everything is becoming more sophisticated, computerized, and detailed. Someone trying to break in to this business has to put up a lot of money to open and compete. Shows like The Walking Dead on AMC, and all the horror movies that are out prove that there is a huge horror audience. In the Philadelphia market alone, there are over 10 major attractions, with many smaller operations. With this much marketing going on, the consumer becomes hyper aware of Halloween haunted attractions, which benefits all of us.